Each spring, I fill containers, hanging baskets, and window boxes with annual and perennial flowers. 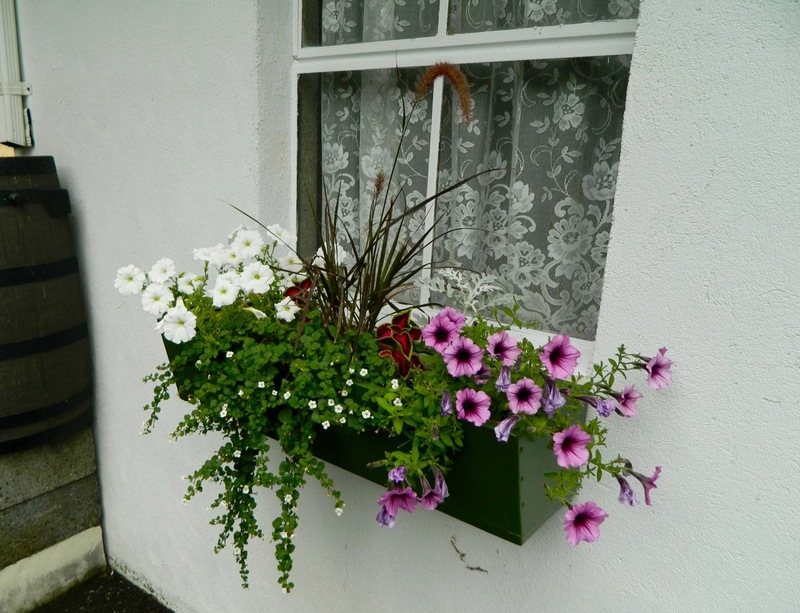 I don't always follow the 'rules' for container planting except to ensure a good quality, well-draining, light and fluffy potting soil. 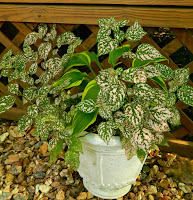 Of course, I give the plants the type of light they need, but I don't worry too much about color combinations and design. 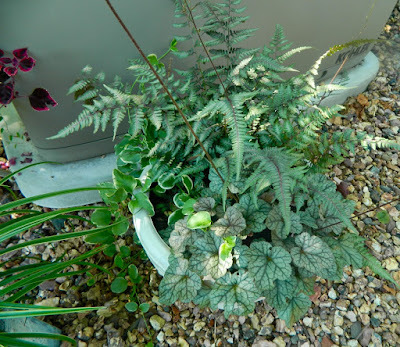 Here are a few of the 30-plus containers I planted this year, starting in the Stone Garden, so called for the crunchy lava rock covering the ground. A creature of habit, I usually place pots of coleus at the entrance to the Stone Garden. This welcoming entrance also leads to the front door. 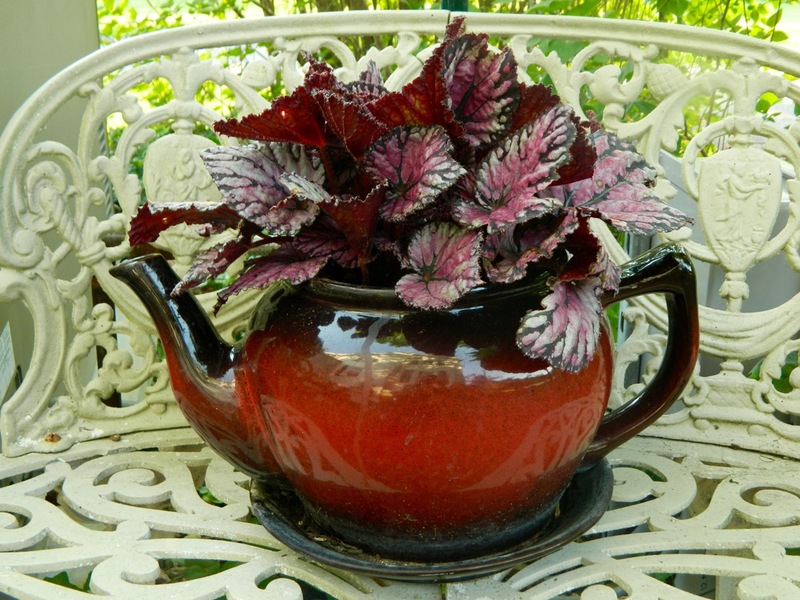 I start coleus from seed, indoors, in early spring. 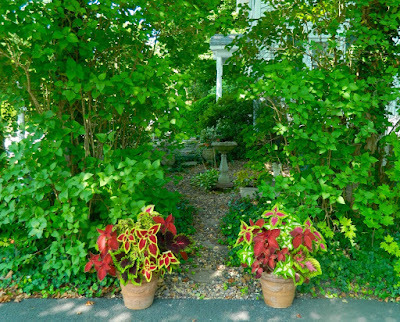 All plants in the Stone Garden need shade. 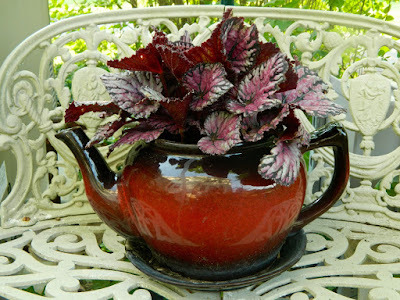 King Begonia, perfect in the teapot planter, sits on a bench in the Stone Garden. 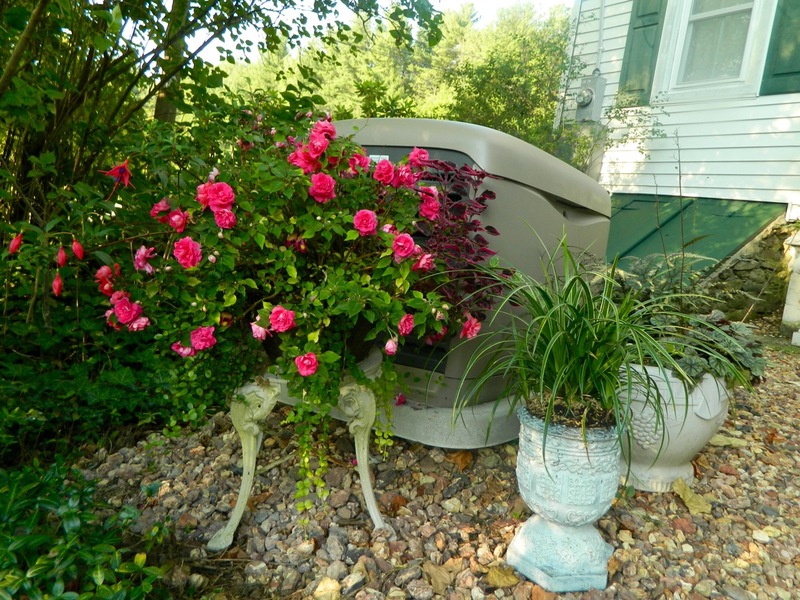 The Stone Garden is my utility area for the generator, air conditioner unit, and water hose. I use strategically placed planters in an effort to distract from their ugliness. 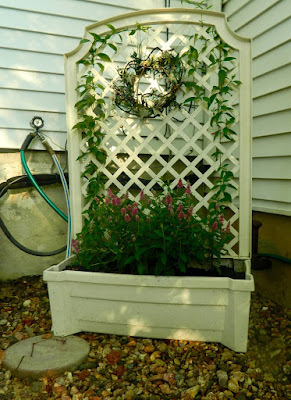 Often, my containers provide temporary homes for new acquisitions -- like the veronica in the trellis planter in the corner of the Stone Garden. I'm surprised the veronica did so well in this shady spot and was prepared to move it if necessary. Soon it will be time to plant it in its more permanent home in the Horseshoe Garden. 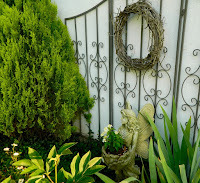 Veronica, tobacco vine, and an ivy wreath. 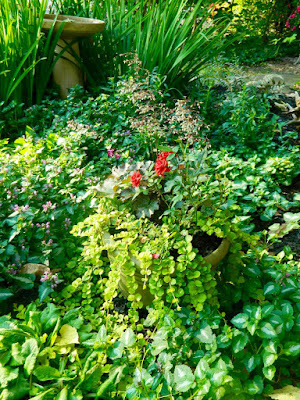 A planter of mixed annuals resides next to two smaller containers of perennials. They successfully detract from the large, ugly generator. I used double impatiens as an experiment to see if the downy mildew problem is over. After three years, I am thrilled the infection didn't reoccur. I will grow more next year. 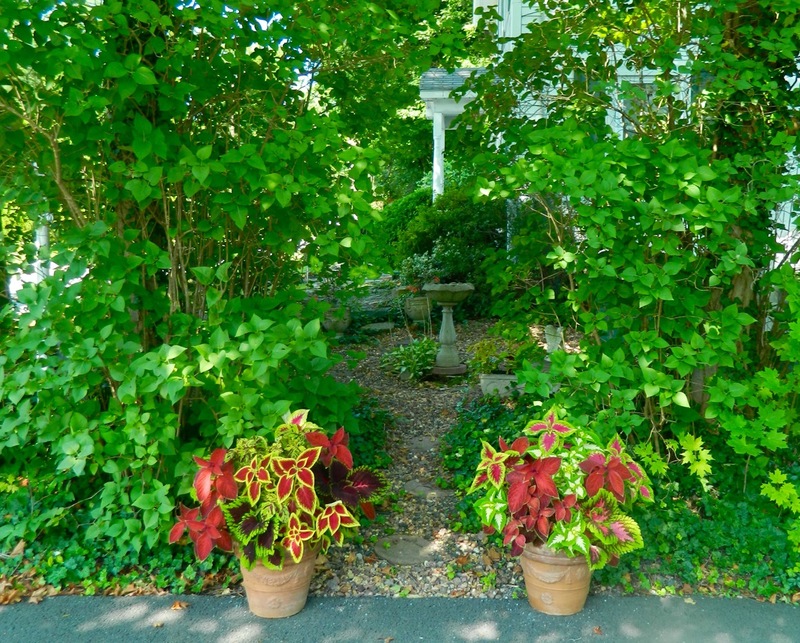 Japanese painted fern, heuchera, and vinca vine. 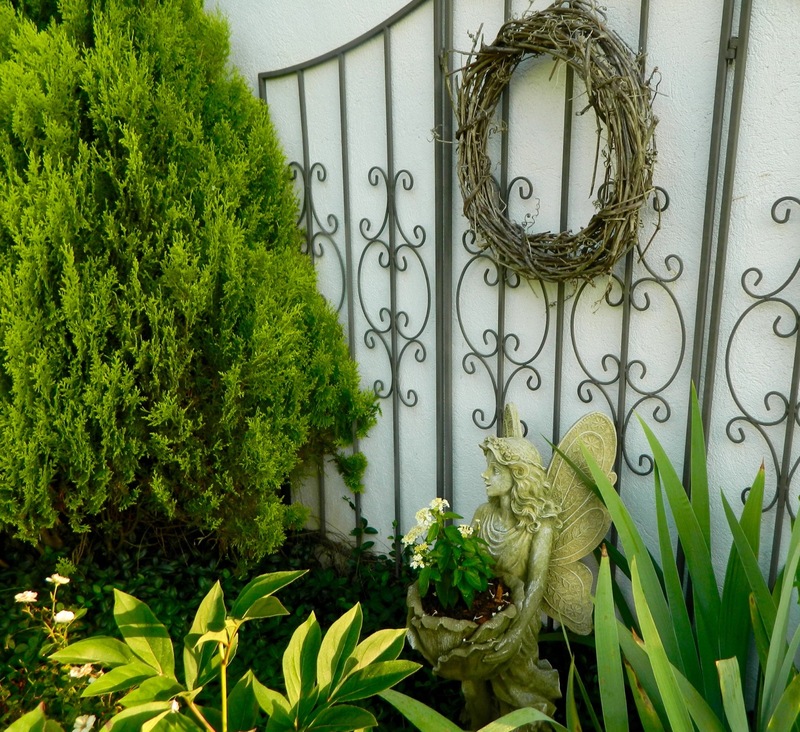 I placed a simple pot of calibrachoa on a wrought iron chair on the front step, as well as in various hanging baskets. Calibrachoa thrives in part shade I've found. 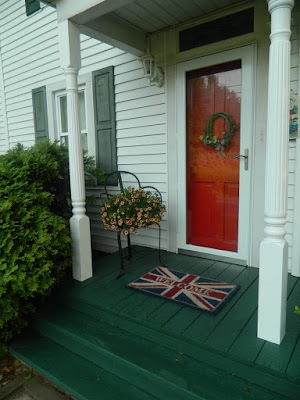 In full sun areas, like the cottage garden and the kitchen garden, I planted several pots of zinnias and marigolds. 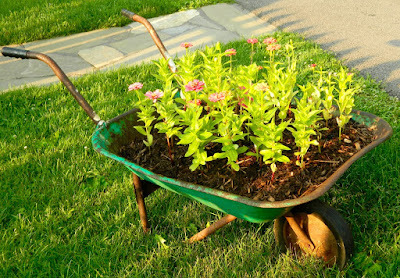 This year, zinnias didn't fare as well as usual, due to the bizarre weather that began with a very dry June followed by an excessively wet July. I start zinnias, marigolds, and snapdragons indoors from seed before the last frost. 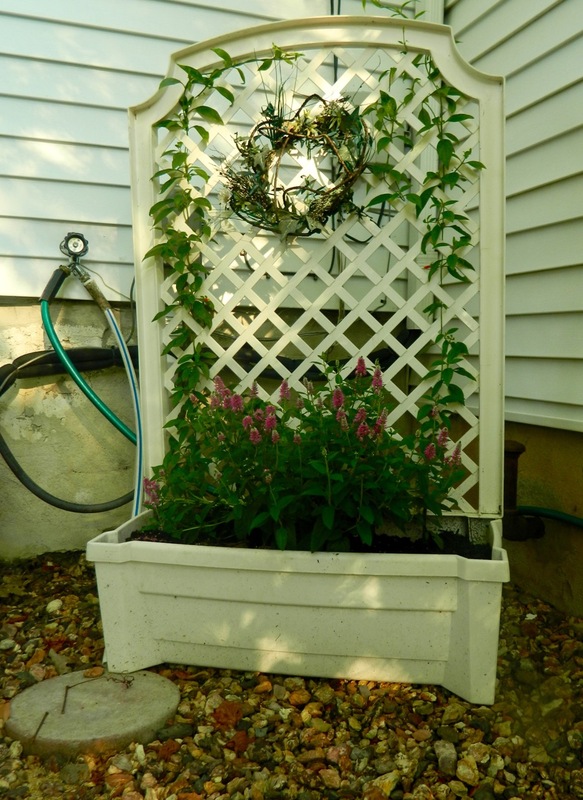 Zinnias and snapdragons in tubs, ivy in a birdcage. 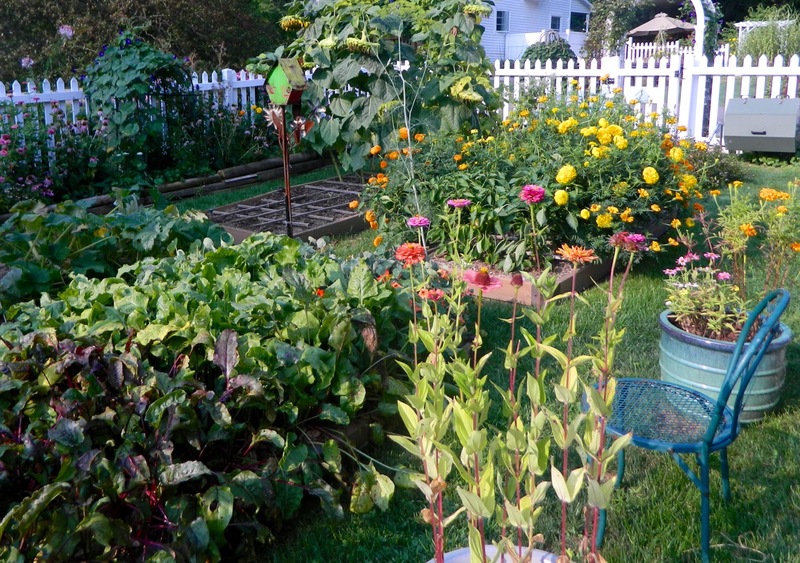 I placed tubs of zinnias and marigolds in the kitchen garden to attract pollinators. 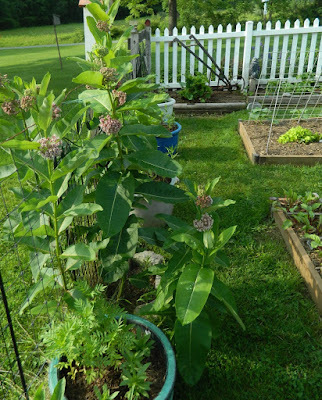 Initially, I put them along the bottom fence next to a stand of milkweed. 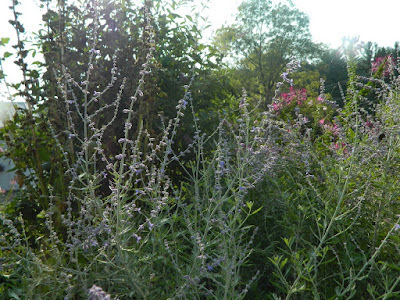 Early morning in the kitchen garden. 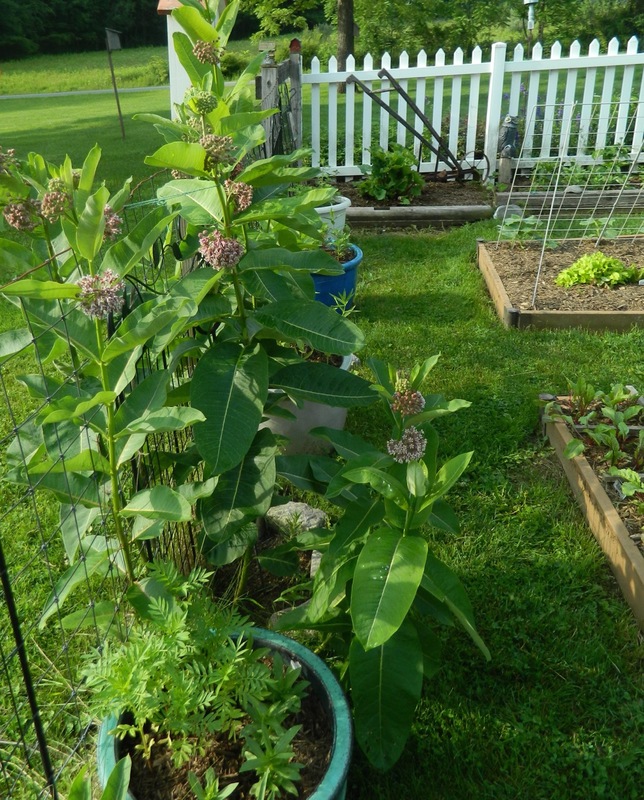 When the milkweed grew up, it shaded the annuals. I moved the containers out into the main vegetable garden where the sun could bless them. Near the pond I display my collection of hypatufa containers. Some I bought, one I made, and some were gifts. I house various succulents in them. 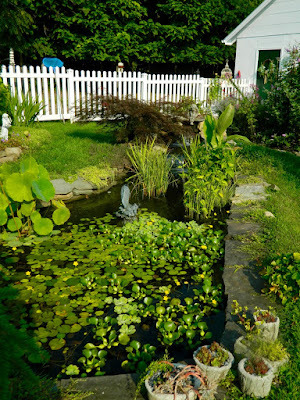 My largest hypatufa sits above the waterfall providing a backrest for the angel there. Morning Glory and moonflowers live in a container against the arbor; in a container on each side I grow perennial sunflowers. I don't plant directly into the ground here because it doesn't drain well. 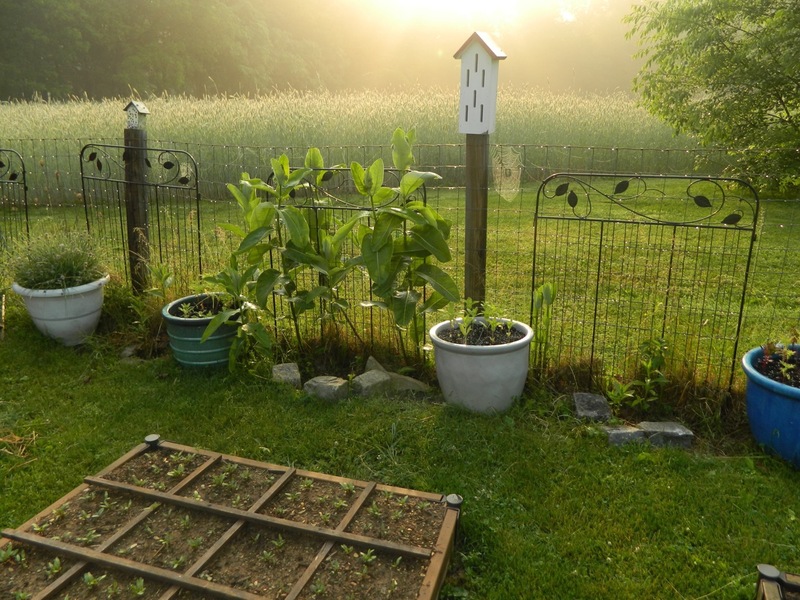 I keep the sunflowers in pots so they don't spread and take over my garden space! 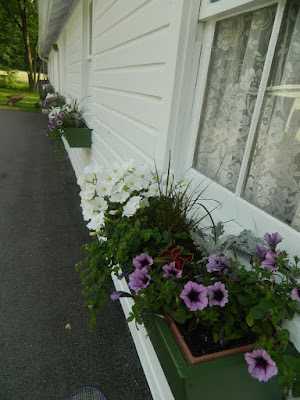 If you look back at previous years' postings you will see similar plantings in my window boxes -- as with the coleus at the entrance to the Stone Garden, I don't mess with what works! My favorite container sits in the Horseshoe Garden where the lamium ground cover provides camouflage, ha ha. My dear friend and former secretary, Pat, sent me the miniature rose following my surgery a couple of years ago. 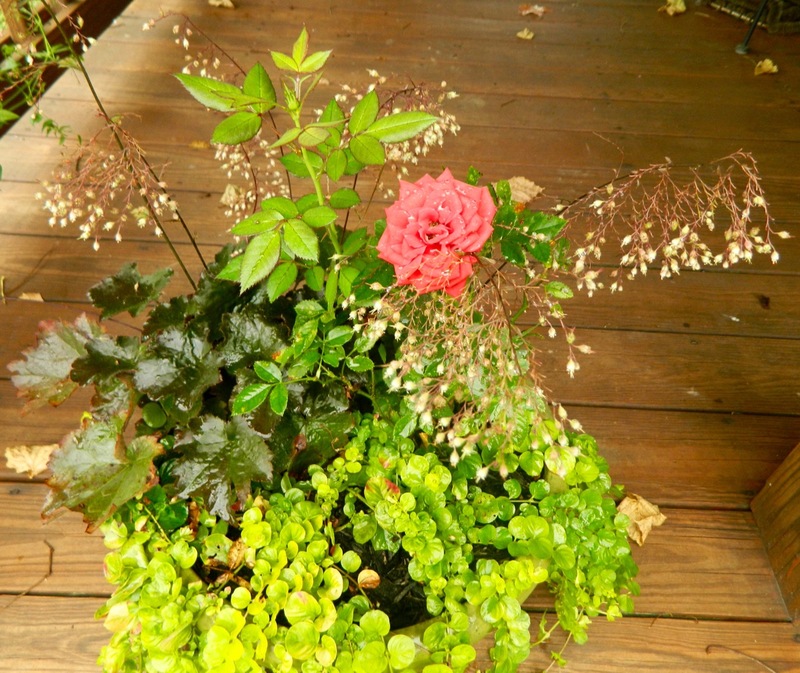 I over-winter the rose indoors and plant it out in spring. It blooms all summer. Miniature rose, heuchera, and creeping Jenny. 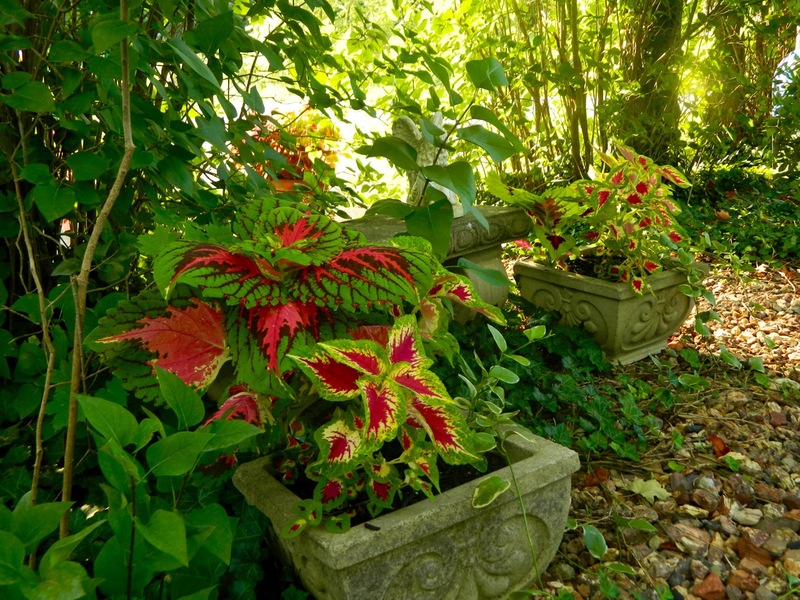 I hope you enjoyed this sampling of my container plantings! I have many more, but I try to limit the number of photos to 12 in each posting, so you don't become too bored. Oops, this posting is far too long. 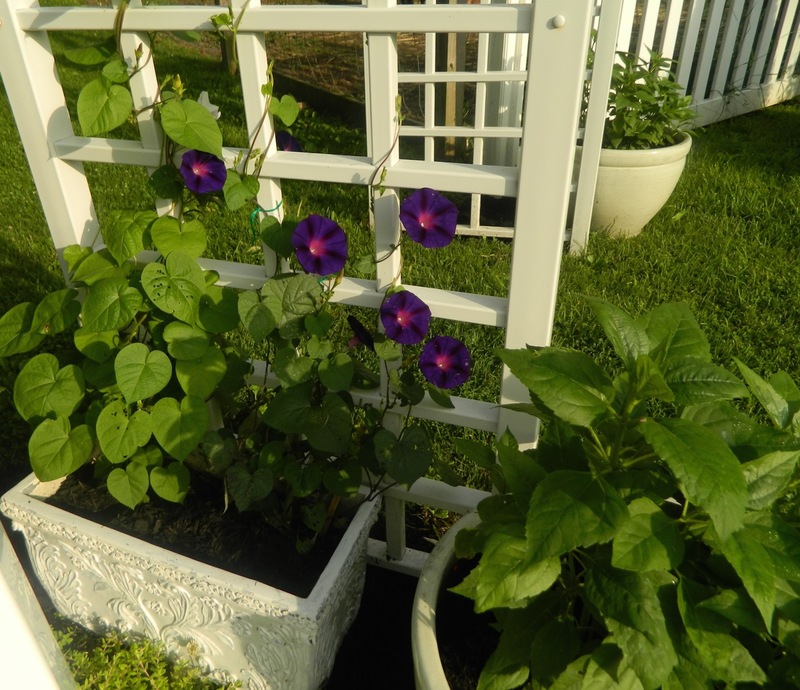 Did you plant containers in your garden this year? Do you have a favorite? It's the first day of September -- next stop fall! The weather doesn't seem to know it on this hot and humid day, although the maples already begin to shed golden leaves on the front lawn, and with the end of the West End Fair, children are back to school. 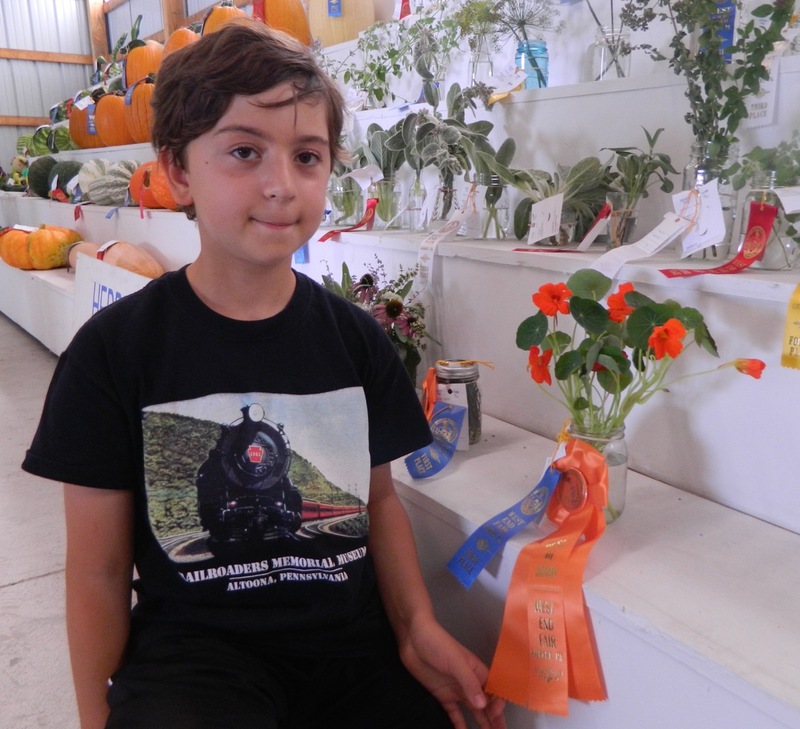 It was a great gardening season exemplified by wonderful flower, herb, fruit and vegetable exhibits at the Fair. There I learned a lot this year. 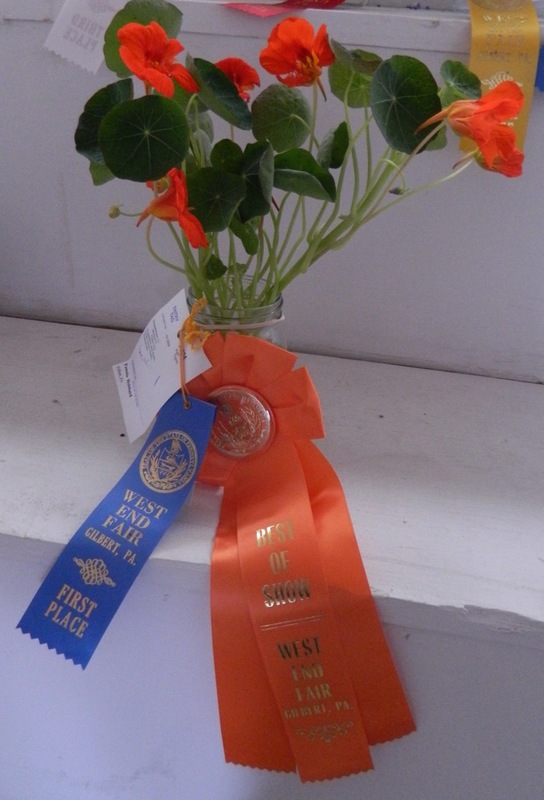 I learned to trust Mother Nature: having spent an inordinate amount of time fussing with fresh flower arrangements for my floor and shelf displays (that took second place ribbons) my simple, three-stem exhibit of nasturtium earned Best of Show -- the first time I won this prestigious award! I grow nasturtium every year to aid pollination in the kitchen garden. 'Empress of India' has a pleasant mounding shape, bright scarlet blossoms, and blue green water-lily like leaves. This is one of the varieties of nasturtium bred so the flowers stand above the foliage. 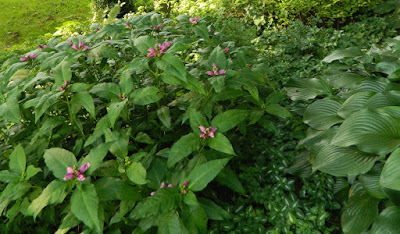 Both flower and leaves are edible with a peppery flavor and I use them to decorate plates of tea sandwiches and add them to salads. 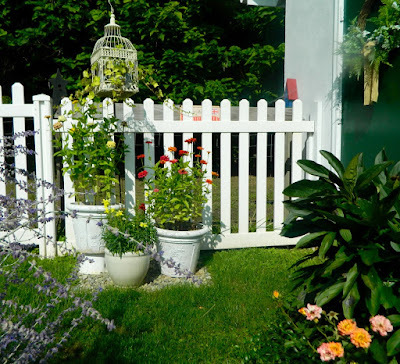 This old-fashioned flower fits right into my cottage garden. 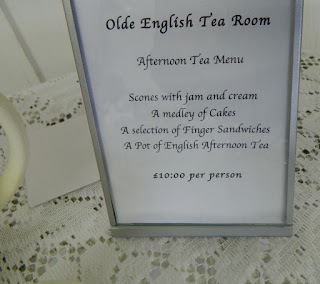 For the floor display, 'Tea Time,' we created an Olde English Tea Room, complete with English menu. With the teapot and other china patterned in yellow and orange, I chose perennial sunflowers, orange zinnias, and marigolds. I was happy with the second place when I saw the entry that won the blue ribbon -- it was outstanding. 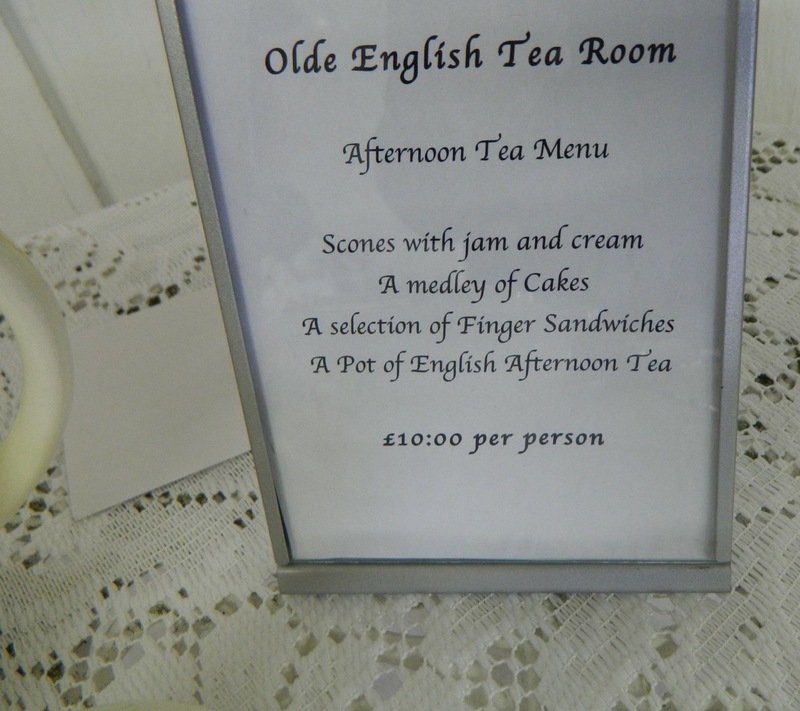 Very stiff competition this year! 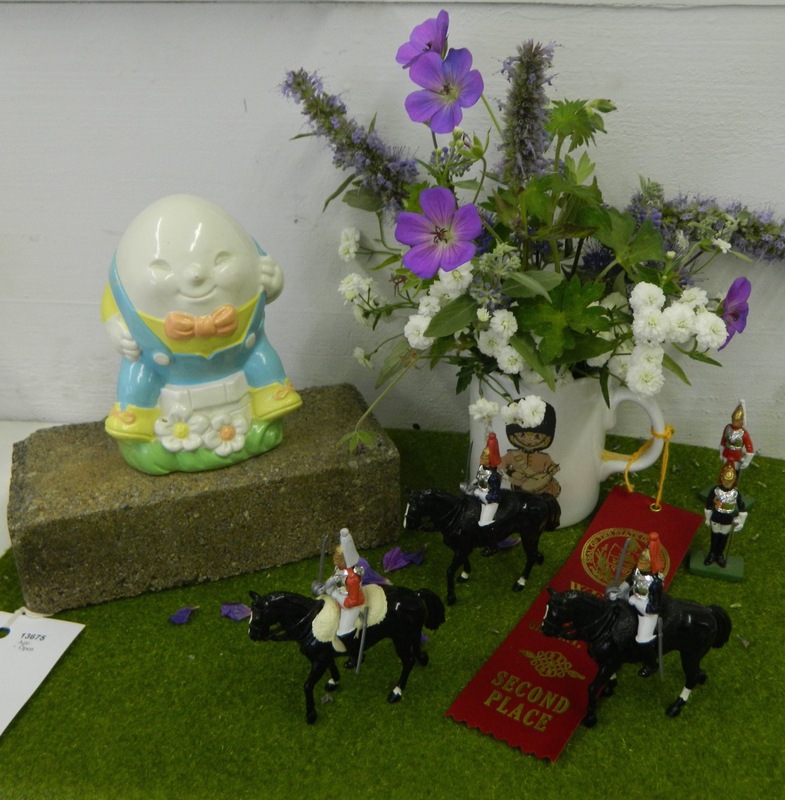 Jon was very proud of Humpty Dumpty and all his King's horses and men in the Nursery Rhymes section. 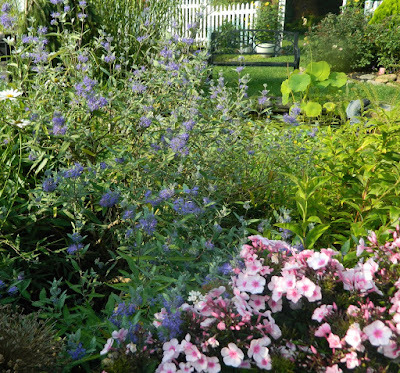 After he arranged them, I added a bouquet of perennial geranium, yarrow 'The Pearl,' and spikes of Anise Hysopp. Another second place. 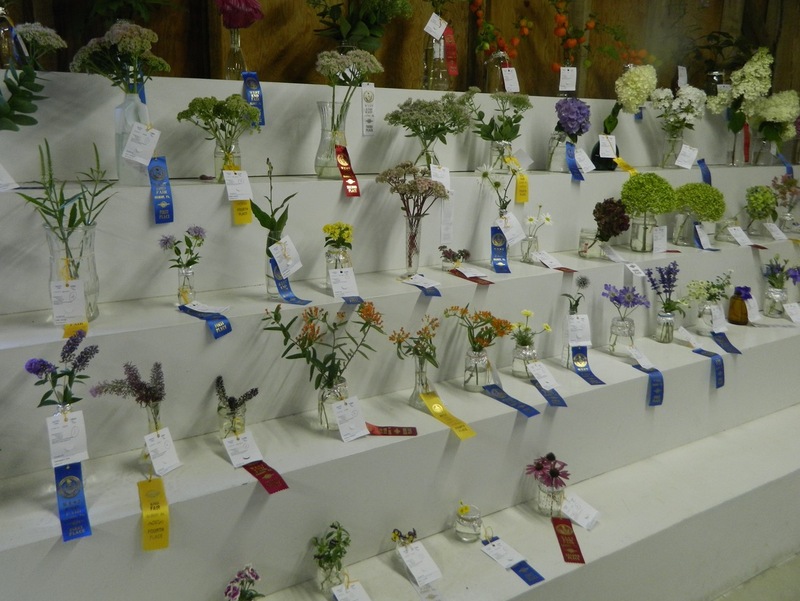 I write a monthly 'Gardening in the Poconos' article for the local newspaper, and my August topic was 'How to Exhibit at the West End Fair.' I should have said 'do as I say, not as I do' as I didn't follow my own advice, being somewhat disorganized this year. 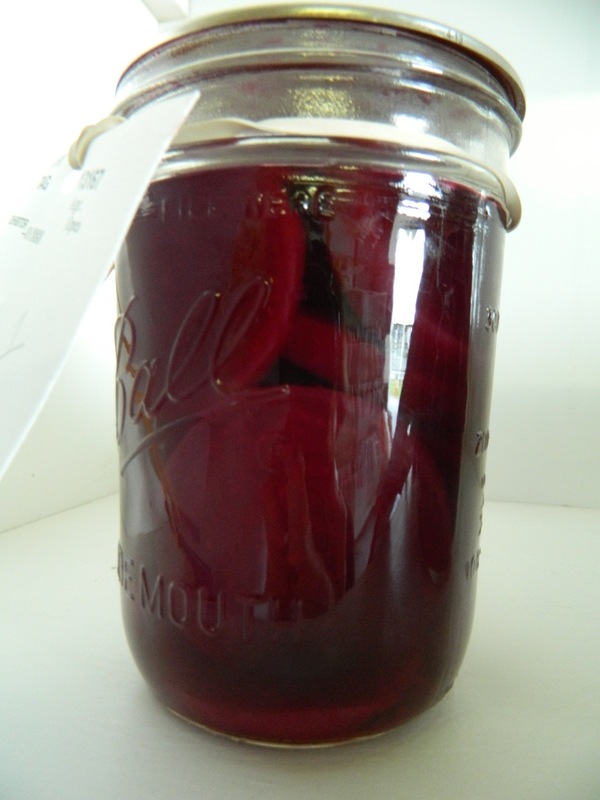 Jon arrived two days before the fair to help me get ready, but instead of immediately preparing the jars as we usually do, I decided we should pickle and can beets because I wasn't ready with that entry. Canning took the whole day and led to a stressful rush to get everything else to the fair on time. 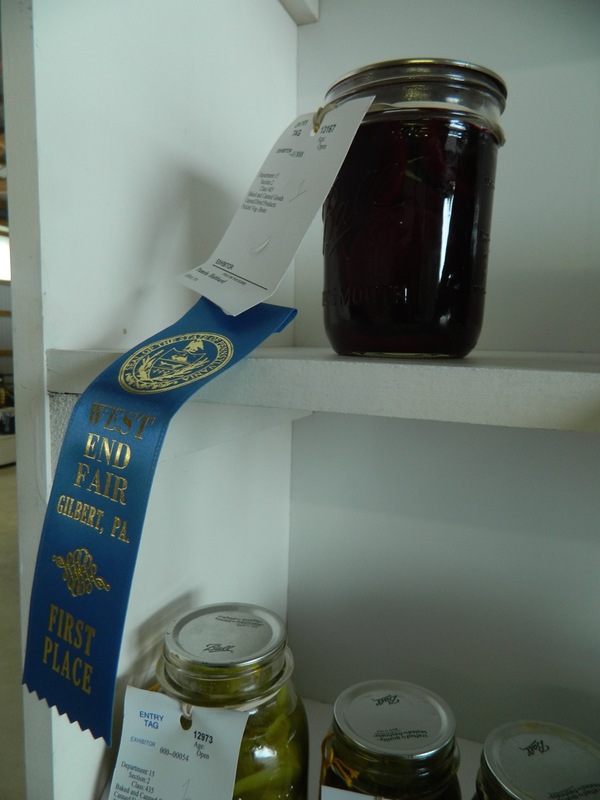 But it paid off when the beets took the blue ribbon! Jon should take much of the credit as he picked and washed the beets, and after I cooked them he slipped the skins off. While I sliced, he mixed the vinegar recipe. We make a great team! Other blue ribbon winners were my lambs ear, Russian Sage, and turtle head. 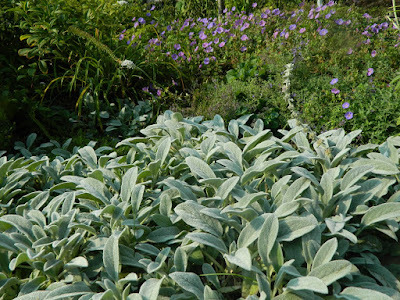 Lambs ears in the foreground, perennial geranium above. 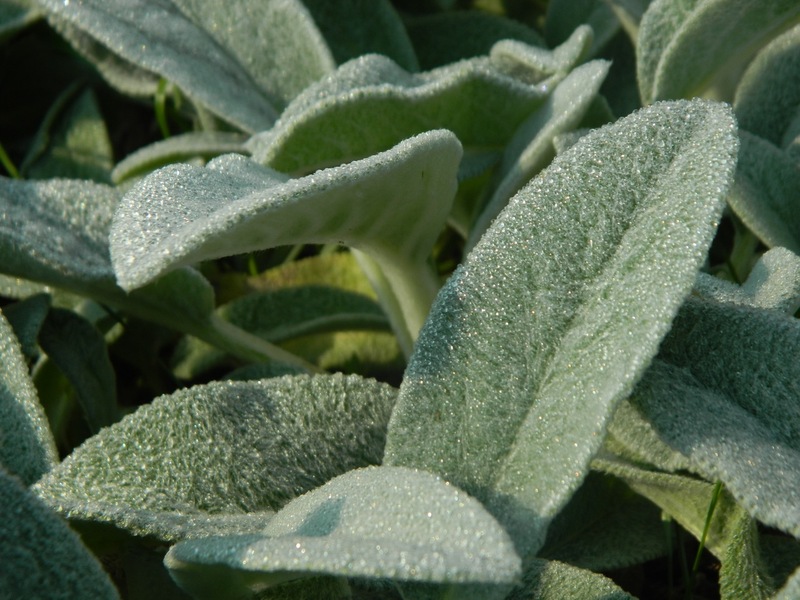 Lambs ear Stachys is a favorite with children. 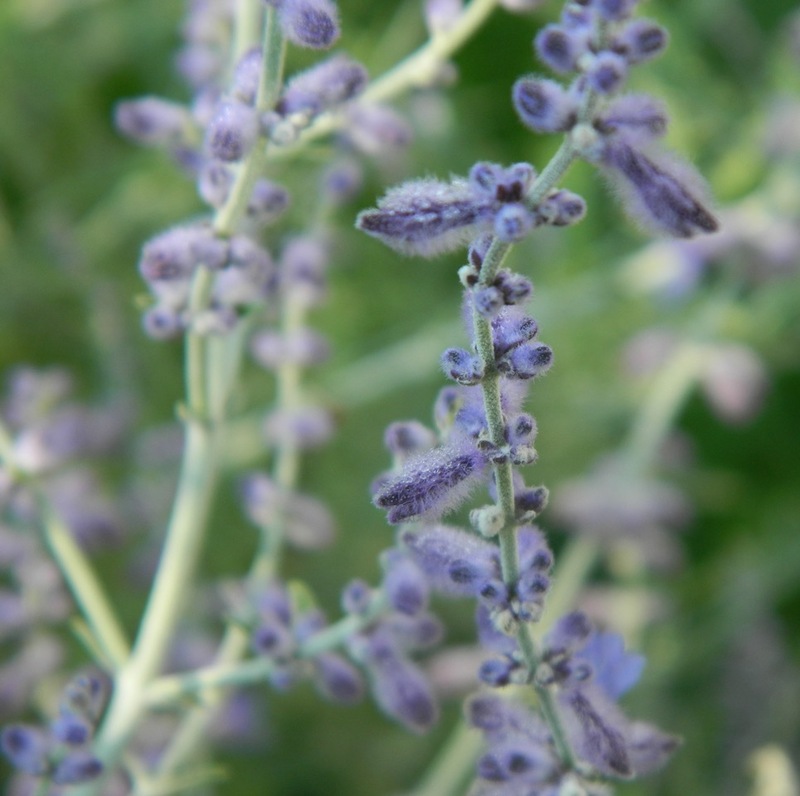 Russian sage is a favorite with bees. For the first time since I have been exhibiting at the fair, the turtle head was in bloom. Always the star of the shade garden in fall, I was excited to enter it. It took a blue ribbon! 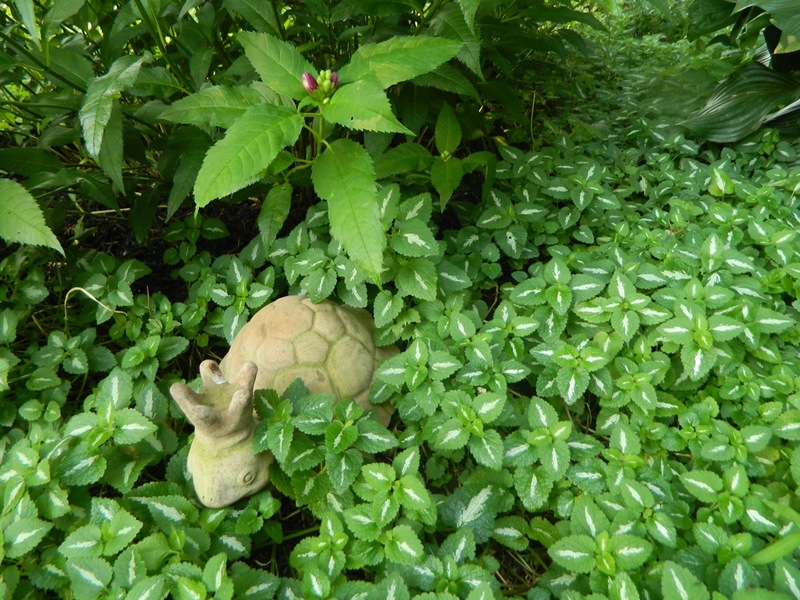 Prince Turtle and the flower named for him. Some of my plants, such as blue mist shrub and pink phlox, are not listed for entry at the fair. 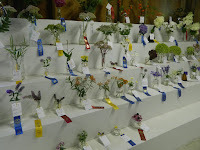 I plan on writing a letter to the fair committee asking for these flowers to be added. 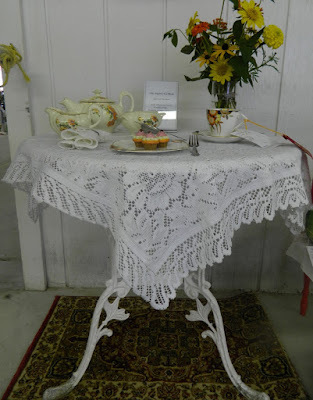 I learned much at the fair this year. 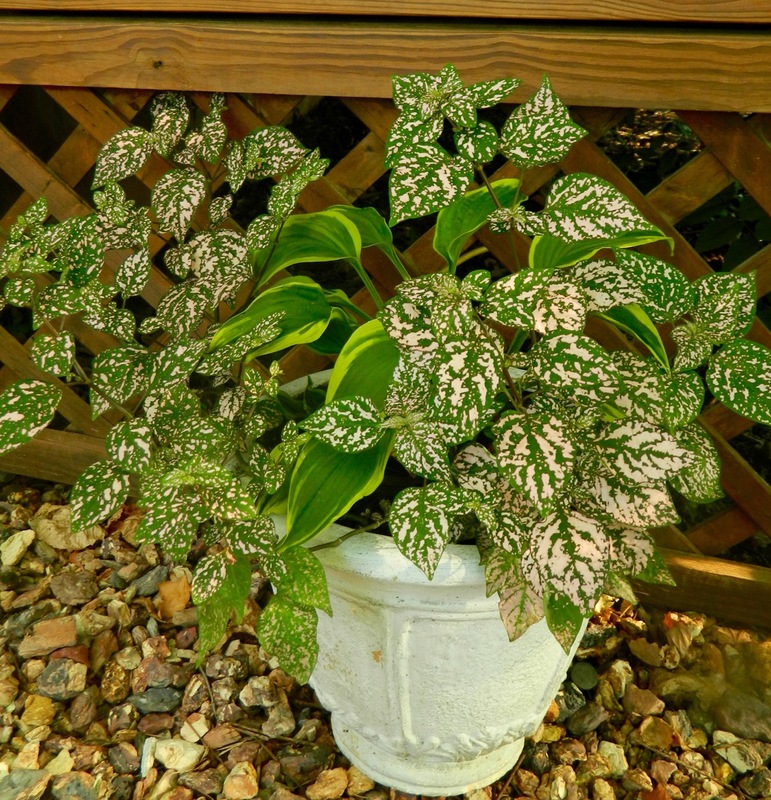 The judges sometimes leave a comment on the plant's ticket and this can be very helpful: I saw that one plant had 'stems too long for vase,' another's 'leaves drooped,' and one flower had a 'bent stem.' 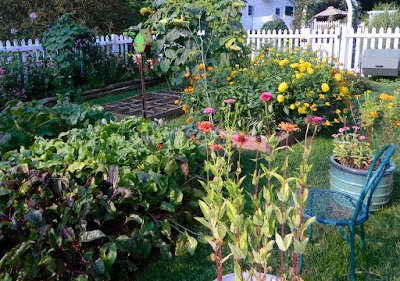 As well as starting to prepare earlier (not canning the day before,) I learned that I still have a lot to learn -- one reason I love gardening! 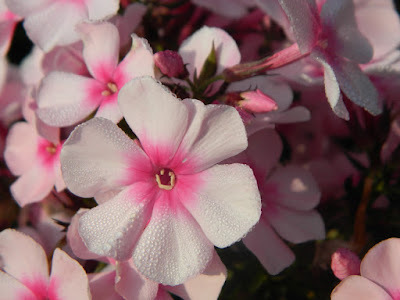 I am linking with Beth at Plant Postings and her Lessons Learned meme and with Helen at The Patient Gardener's Weblog for her End of Month View. Also, with so much to celebrate (ten blue ribbons including Best of Show) I am linking with Donna at Gardens Eye View and her Seasonal Celebrations meme. Please visit these excellent blogs. Still some summer days left and the glories of autumn to look forward to. Enjoy!